Synchronization is a beautiful thing. It allows the motor in your car to work efficiently. I know nothing about synchronized swimming or figure skating, but I will admit when watching it during the Olympics, it is a thing of beauty. Even synchronization with phones and devices using Bluetooth has become a must. When I take my truck in to the local dealership for service, its great to get the oil changed, tires rotated, fluids checked all at the same time. I do not want to go in separately each time to get this done, because I do not have the time. Syncing your medication is also a great idea and I will share a few reasons why. Syncing your medication so it is all scheduled to run out at the same time will help keep you on track; plus, it will save you time money and aggravation. It could also save you or a loved one's life. The Canadian Pharmacists Association reports 30% of Canadians reported they stopped taking medication before they were advised to and about one in four reported not filling a prescription they were given, or they took less medication than prescribed. Studies have consistently shown around 25% of hospital readmissions were medication related and of those readmissions 50-70% were related to not taking your medication as prescribed. Nobody wants to spend anymore time in a hospital than they must. Syncing all your medications is an easy task. You can bring in all your medications or we can pick them up. Pharmacy staff will count all your medication and fill what is necessary so there is a consistent quantity of medication across the board. If your medication is all due to run out at the same time, you only make one trip to the pharmacy and it will be a fast one, because your order will be pre-done and ready to go. In fact, you do not even have to go to the pharmacy or call in to order your medications. Once we have medications synchronized, we can save your refill date in a calendar and automatically deliver your medication. If you prefer a courtesy call, email or text to remind you your medication is ready, YES we can do that too. If you prefer your order to be held for pick up, that works as well! Now we would never force any customer to line up their medications. 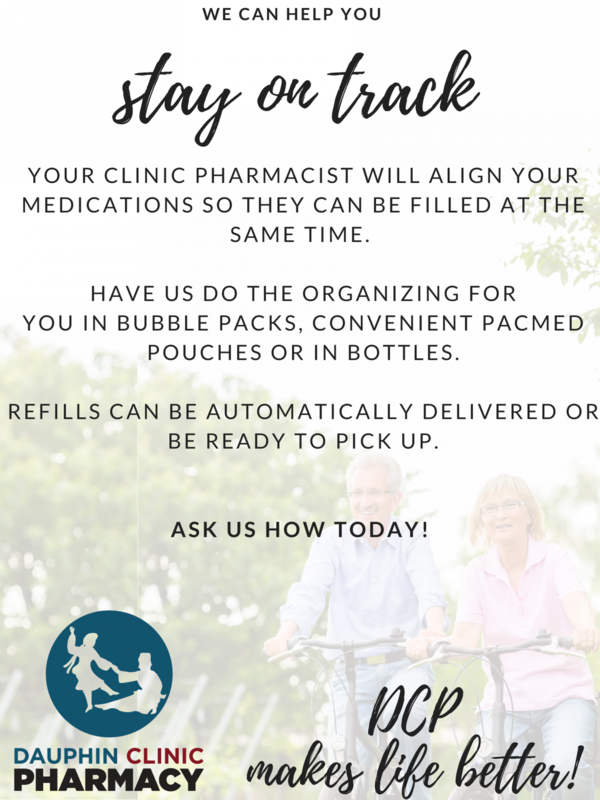 If you enjoy coming to the pharmacy as an outing (and some of our customers do) and do not have trouble remembering to refill your medications that is great! It is all about your choice. If you purchase over the counter vitamins or minerals to take with your medication, we can even line these up by filling them in the dispensary. Delivery or pick up schedules can be customized to your liking. One thing we have noticed DCP customers enjoy is your medication can be synced so it never runs out on a weekend. While we are open 7 says a week, you may not want to have to run to the pharmacy on a precious Saturday or Sunday. If you forget to take some medication along the way, we can always adjust your schedule. If a new medication is added, we will always fill it to line up with your other medication. With medication synchronization a pharmacist can worry less about missing a refill and focus on proactively managing your medications, so they work best for you. Medication synchronization works extremely well with our bubble (blister) packs or our Pac Med Strip packaging, but it can easily be done with bottles of medication too. Its really your choice. If you must submit receipts for third party insurance like Manulife or Blue Cross, synchronizing your medication will reduce the amount of times you need to submit receipts. Canadians not taking their medication is costing the Canadian Healthcare system up to $19 billion and is costing Canadians their health and even their lives. Make sure it is not costing you or a loved one! Remember; we can help you to remember to take your medication. And that will help you get healthy and stay healthy. So, make life better and a little more in-sync.